These are the best chocolate chip cookies folks, seriously, you do not need to look any further. This recipe came from Cooks Illustrated so you know it has been tried, tested and approved. These cookies have also been tried, tested and approved in my house as well as many of my friend’s houses, and they are always declared by all as the “best chocolate chip cookie.” I bake these up all the time for bake sales, classroom birthday parties, but I mostly bake them for pure pleasure because they are just so darn good. These cookies have crunchy edges, chewy centers and there are chips in every bite. They’re the perfect afternoon craving throw together at the last minute cookie because you don’t have to plan ahead and bring any of the ingredients to room temperature first. 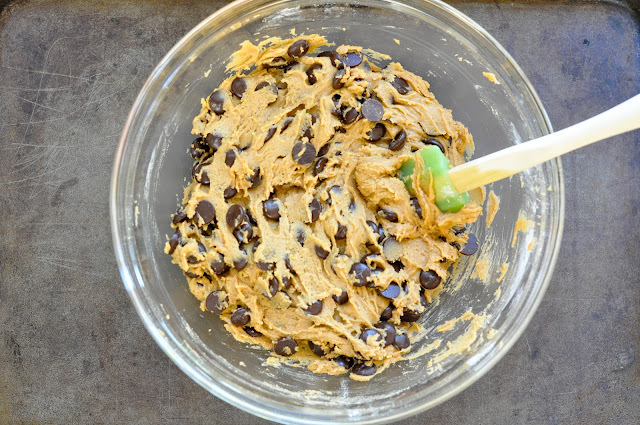 Just grab everything out of the pantry and fridge, mix it together, drop some cookies on a baking sheet and bake away. There’s no need to write more, you just have to trust me and make some up. 3/4 cups packed dark brown sugar (dark brown sugar adds more flavor) – Use fresh, moist brown sugar instead of hardened brown sugar, which will make the cookies dry. I like and use the brand, Wholesome Sweeteners Organic Dark Brown Sugar, as well as the Whole Food’s organic brown sugar. 1 large egg – The recipe doesn’t call for the eggs to be at room temp, but if I know I’m making them up ahead of time, I will take them out a bit beforehand. 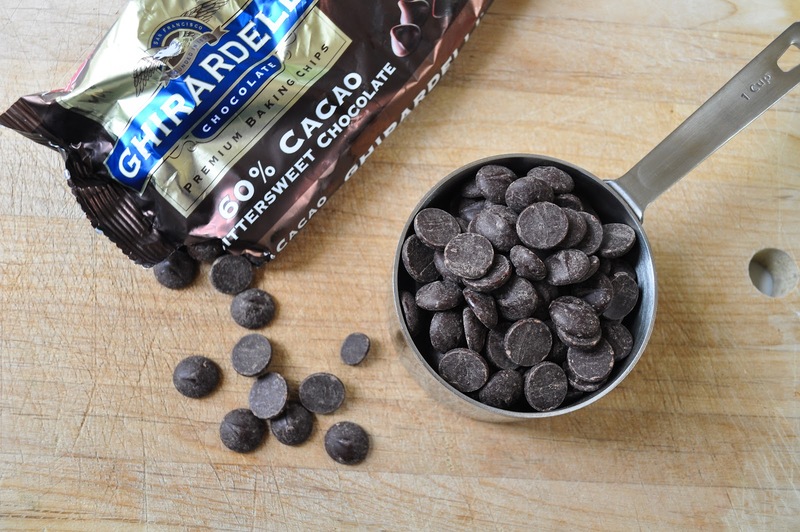 1 bag (10-ounces) of chocolate chips or chunks (preferably 60% cacao) – I use Ghirardelli 60% cacao chips. I like to prep all my ingredients ahead of time so when I have to add them they are ready to go. Adjust rack (or racks if you have 2 ovens) to middle position and preheat oven/ovens to 375 degrees. Line 2 large baking sheets with parchment paper. 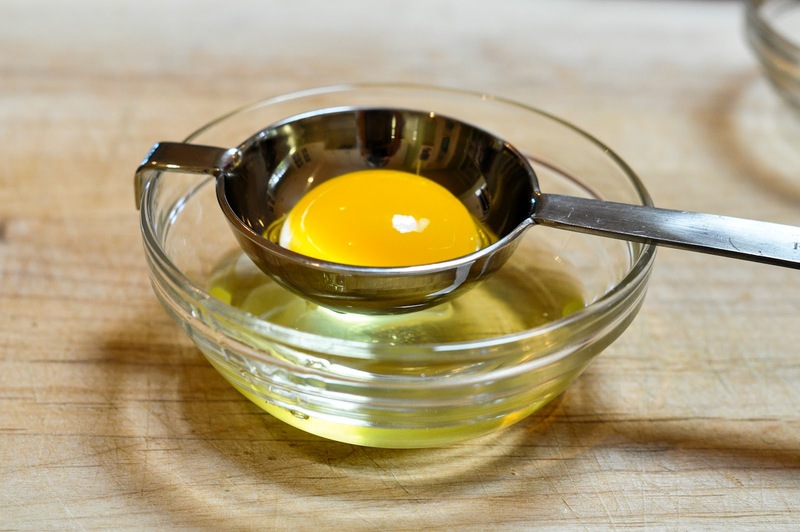 Crack your egg over a small bowl using an egg separator or your hand to separate the egg yolk. Put the egg yolk in a small bowl and set aside. Whisk 1 3/4 cups flour and 1/2 teaspoon baking soda together in a medium bowl and set aside. Whisk the 1/2 cup sugar, the 3/4 cup brown sugar and the teaspoon salt together in small bowl and set aside. Divide up the butter, put 10 tablespoons into a 10-inch skillet. Note: Avoid using a non-stick skillet to brown the butter; the dark color of the nonstick coating makes it difficult to gage when the butter is browned. Put the remaining 4 tablespoons butter into a large heatproof bowl. I recommend cutting up the butter once its divided, so it melts easier. Heat the 10 tablespoons butter over medium-high heat until melted, about 2 minutes. Continue cooking, swirling pan constantly until butter is dark golden brown and has a nutty aroma, 1 to 3 minutes. Remove skillet from heat and, using heatproof spatula, transfer browned butter to the heatproof bowl that holds the 4 tablespoons of butter. Stir the butter together until completely melted. Add the sugar and salt mixture plus the 2 teaspoons vanilla to the bowl with butter and whisk until fully incorporated. Add in the egg and the yolk and whisk until mixture is smooth with no sugar lumps remaining, about 30 seconds. Let mixture stand 3 minutes, then whisk for 30 seconds. *Chocolate lovers addition! I wanted to share with you all an adaption that my little 8-year old friend Tatum did! Tatum is a chocolate lover, so she decided to add 1/4 cup of melted chocolate chips to the batter at this point. She just melted 1/4 semi-sweet chips (or you can use bittersweet chips) and added it to the batter, making an even more chocolately cookie! I sampled a few of her cookies, and they were super yummy! Thanks Tate, you’re truly a chef in the making! Repeat process of resting and whisking 2-3 more times until mixture is thick, smooth and shiny. NOTE: This whisking and waiting time is an important step and really makes a difference with the texture of the cookies. The brown sugar mixture will thicken and lighten up as you whisk it and let it rest. Note: Your batter may not look as thick as my batter in the below photo, but it should still thicken up. Using rubber spatula or whisk, stir in the flour mixture until just combined. Stir in the chocolate chips, giving the dough a final stir to ensure no flour pockets remain. At this point, I put my batter into the refrigerator for about 5 minutes, as it can sometimes be too soft to handle. A note about chocolate chips, my family prefers dark chocolate to milk chocolate, so we use these Ghirardelli 60% cacao chips. They are amazing, and they do say that dark chocolate is good for you, so that may help take some of the guilt away. Try them in your next recipe that calls for chocolate chips. Divide dough into 8 portions per cookie sheet. I use my handy dandy ice-cream scooper here. The ice cream scooper I used is 1 3/4″. 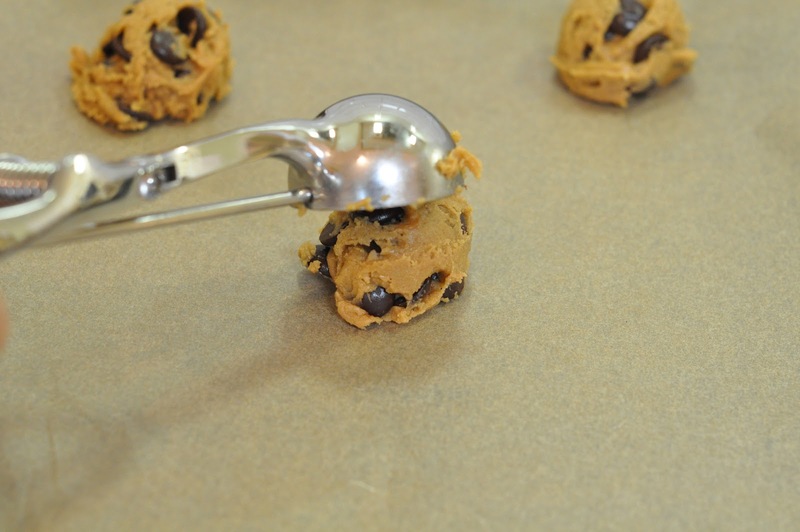 If I use my 2″ scooper than I get 16 cookies per batch. Arrange cookies 2 inches apart on the prepared baking sheets. You will have 8 dough balls per sheet. If you wanted to add a bit of Maldon or flaky sea salt crystals to the tops of the cookie, you can do so at this point. Just sprinkle a bit on the top of each dough ball. Bake cookies 1 tray at a time (or both trays if you have a double oven) until cookies are golden brown and still puffy, and edges have begun to set but centers are still soft, 10 to 14 minutes. You will want to rotate the baking sheets halfway through baking (after 5 minutes). In my oven the total cooking time is about 10 minutes. Note: They may look under baked in the center but don’t fret, they will brown and firm up once they are out of the oven. Transfer cookies to wire rack to cool. 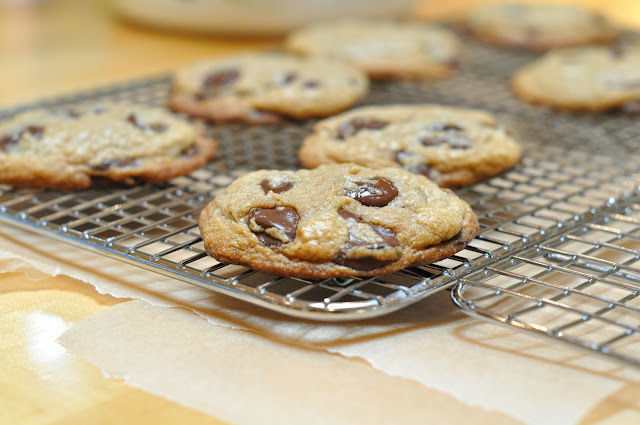 We always have a cookie when they are still warm and the chocolate chips are gooey! Pair it up with a tall glass of milk and you have the perfect dessert or snack! I just recently took this recipe and threw it all into a 12-inch cast iron skillet to make the best chocolate chip skillet cookie. So, if you’re looking to make up a “big” cookie then give this skillet cookie a try. I love taking these cookies to a party paired with our favorite fudgey brownies ever! You can’t go wrong with either of these desserts! Looking for a gluten-free version of a chocolate chip cookie? Then you have to try my gluten-free cookie bites, they are made with 5 simple pantry ingredients and the 2 main ingredients are walnuts and dates. The walnuts add a buttery taste and the dates add the sweet, but without the refined sugar. Try them, they’re amazing and totally kid approved! I’ve also made a gluten-free version of our favorite brownie recipe ever and it tastes totally the same as the original version! Try it! ¾ cups packed dark brown sugar (dark brown sugar adds more flavor) - Use fresh, moist brown sugar instead of hardened brown sugar, which will make the cookies dry. I like and use the brand, Wholesome Sweeteners Organic Dark Brown Sugar, as well as the Whole Food's organic brown sugar. 1 large egg - The recipe doesn't call for the eggs to be at room temp, but if I know I'm making them up ahead of time, I will take them out a bit beforehand. Adjust rack (or racks if you have 2 ovens) to middle position and preheat oven/ovens to 375 degrees. Crack your egg over a small bowl using an egg separator or your hand to separate the egg yolk. Put the egg yolk in a small bowl and set aside. Whisk 1¾ cups flour and ½ teaspoon baking soda together in a medium bowl and set aside. Whisk the ½ cup sugar, the ¾ cup brown sugar and the teaspoon salt together in small bowl and set aside. Divide up the butter, put 10 tablespoons into a 10-inch skillet. 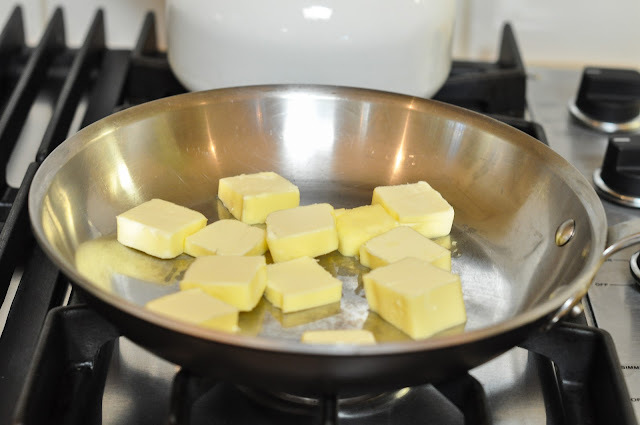 Note: Avoid using a non-stick skillet to brown the butter; the dark color of the nonstick coating makes it difficult to gage when the butter is browned. Put the remaining 4 tablespoons butter into a large heatproof bowl. I recommend cutting up the butter once its divided, so it melts easier. Heat the 10 tablespoons butter over medium-high heat until melted, about 2 minutes. Continue cooking, swirling pan constantly until butter is dark golden brown and has a nutty aroma, 1 to 3 minutes. Remove skillet from heat and, using heatproof spatula, transfer browned butter to the heatproof bowl that holds the 4 tablespoons of butter. Stir the butter together until completely melted. Add in the egg and the yolk and whisk until mixture is smooth with no sugar lumps remaining, about 30 seconds. Let mixture stand 3 minutes, then whisk for 30 seconds. Repeat process of resting and whisking 2-3 more times until mixture is thick, smooth and shiny. NOTE: This whisking and waiting time is an important step and really makes a difference with the texture of the cookies. Note: The brown sugar mixture will lighten up and thicken as you whisk it and let it rest. 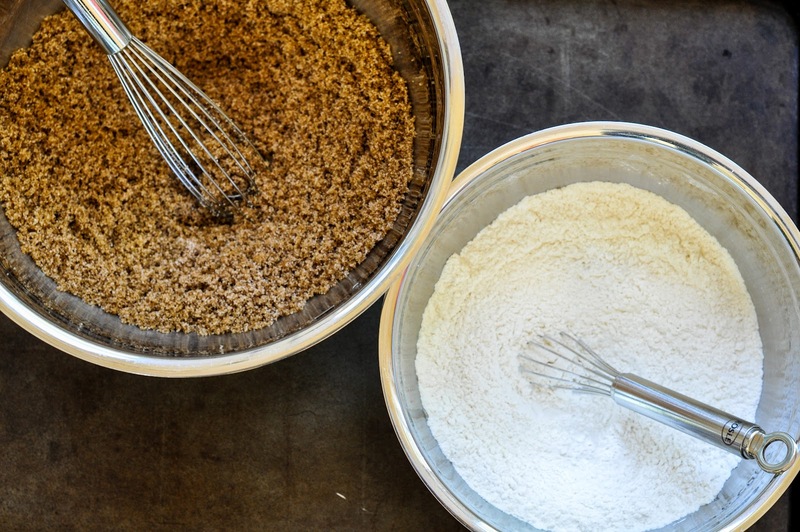 Using rubber spatula or whisk, stir in the flour mixture until just combined. Stir in the chocolate chips, giving the dough a final stir to ensure no flour pockets remain. At this point, I put my batter into the refrigerator for about 5 minutes, as it can sometimes be too soft to handle. 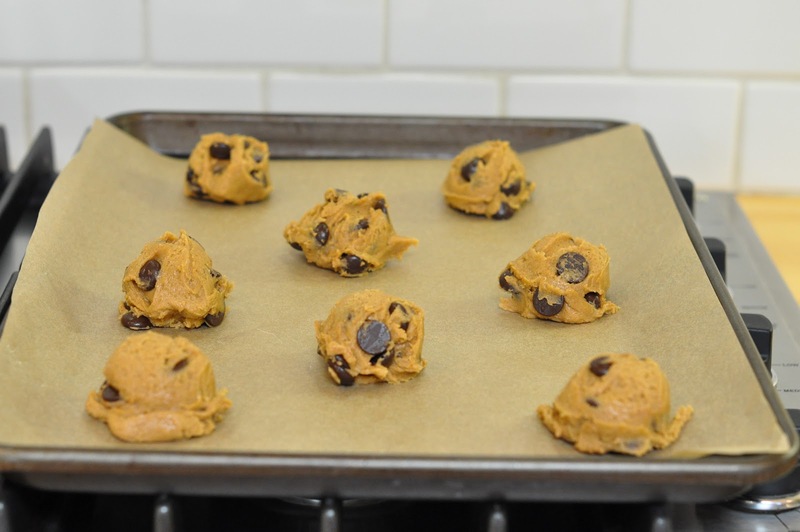 Divide dough into 8 portions per cookie sheet. I use my handy dandy ice-cream scooper here. The ice cream scooper I used is 1¾". If I use my 2" scooper than I get 16 cookies per batch. Arrange cookies 2 inches apart on the prepared baking sheets. You will have 8 dough balls per sheet. If you wanted to add a bit of Maldon or flaky sea salt crystals to the tops of the cookie, you can do so at this point. Just sprinkle a bit on the top of each dough ball. Note: They may look under baked in the center but don't fret, they will brown and firm up once they are out of the oven. Transfer cookies to wire rack to cool. We always have a cookie when they are still warm and the chocolate chips are gooey! Pair it up with a tall glass of milk and you have the perfect dessert or snack! Made these chocolate chunk cookies today and they were exceptional. The only substitution I made was Callebaut brand chocolate chunks instead of Ghiradelli chocolate. We like Callebaut brand chocolate best. Next up will be your brownie recipe. I will be spending more time in the gym to burn off your recipes. You rock Mama! Hi, its me from your chocolate cake page, asking questions again! So I decided I’m going to take your advice and make these instead of the sea salted ones. As I was looking at the recipe for the sea salted ones, I noticed that you sprinkled the salt on top of the cookies before you baked them. So I was just wondering if the same method would work for these, if I sprinkled flaked sea salt on top? Oh, I feel so honoured you posted that picture for me! And thank you for the reply, I shall be making these to share tomorrow and will follow your advice about putting the salt on some and not others and will feedback to you! I must say it didn’t look promising before the addition of the egg, but from then on everything was beautiful. When I tried to eat them warm, they just fell apart and had the most amazing texture and taste. When they firmed up when cooled they had a fudgey texture which made them moreish. I shared them with friends and they went down really well! Just new to your Blog, don’t know why I never found it before!! Have tried several things and love everything so far, just made these choc chip cookies, mine are delicious although a little flatter looking than your pictures, I didn’t have all purpose flour and used cake flour, I’m thinking that could have made the difference, I will defiantly try again after buying all purpose flour. great blog. glad I stumbled upon it. for future reference, it’s “friends’ houses” instead of “friend’s” unless you were talking about one friend, which I don’t think was the case here. just have a habit of dropping grammar fixes on blogs that I think are worth the extra effort. looking forward to following this recipe. thank you! I used all sucanat (evaporated cane juice) in place of the granulated sugar and brown sugar, and einkorn wheat flour in place of the all-purpose flour, and they turned out awesome. The browned butter/sugar/egg/whisking thing is extremely cool. Before your eyes, this stuff turns into something that looks heavenly and smells like caramel. Thanks for posting this! It appears that I, like others, can not stop making these cookies. I made another batch for the family yesterday, this time with coconut sugar and sprouted einkorn flour, and they were just as amazing as the first batch! My husband who was trying them for the first time just closed his eyes and said, “Oh wow.” That’s a big compliment. 🙂 We also made your favorite kale salad last night with dinner and everyone loved it. We already eat a ton of kale, but always cooked, so this was so fun to have it a new way! Just made these and consumer one… AMAZING!!! The best ever. Thank you and thanks to CI… Now what to do with them so I don’t eat the entire batch. I made several batches over the course of a month this past winter, and had to stop…I could not control myself – they were so good. Would you suggest doubling the recipe? I would love to try these out, but need to make a much larger quantity of cookies. Also, how big in diameter do your cookies turn out to be? Would you be against reducing the scoop size to make smaller ones? I just made a batch of cookies and we loved them!!! Although it’s always a little hard to bake English or American recipes as the ingredients you get here are – naturally – different ones and you sometimes must improvise. Plus, calculations of temperatures, weight units etc. are a little annoying. Still, the cookies as well as the Israeli couscous salad turned out great which means these things won’t stop me from trying your recipes! Thanks for all the good ideas and step-by-step instructions! I made the skillet cookie the other day and it was so good that I knew I would have to try the recipe as regular cookies. They turned out amazing! I really love your blog – you do a great job writing up the recipes and I have loved everything I’ve tried from your site. I feel like you are my recipe curator who has found all these delicious things to eat… I trust that when I make something from your site, it will come out correct and chances are high that it’ll be very tasty. Thanks Jackie! Yaay! I’m so glad you made and loved the cookie version as well. I’m making up a batch for an Olympic party tomorrow night. They’re so easy and a kid favorite! I just made these. I had to> After all, it’s freezing here in New York and what better thing to do on a wintry day then to bake! They were delicious – not too sweet, which I personally don’t like. Great texture. I love that I didn’t have to haul out the mixer. I baked these for 12 minutes, but I think next time (the rest of the dough is in the freezer ready for a “cookie emergency – which I have frequently) I will bake them for about 11 minutes so they’re a tiny more chewy. I really like your blog and your incredible attention to detail. I was thinking to myself that it really must take so much of your time to do this blog and then I read your wonderfully honest post about taking a break. How refreshing to read that. You are an interesting and “real” person. Thank you for being so honest. It’s refreshing. I agree about “putting on airs”. Have a great rest of the evening, Jackie! I will be trying your other recipes soon. Hi, do you need to alter this recipe for high altitude? Thank you! I just made these last night for my husband to hand-out at work during his 2 1/2 hour presentation. They turned out so well! Baked for 12 minutes in my oven. Followed the recipe to a T but I used my KitchenAid since it was easier than doing by hand. I want to add chopped pecans next time. Really tasty. I used a smaller scoop and got 30 cookies. The last batch I over baked by 1-2 minutes but I prefer them that way as they were more crunchy…yummy! Hi! im making these at the moment, but my sugar and butter mixture just wont thicken, i’m allowing it to rest like you suggested, repeated the process several times, but the batter just won’t thicken, what should i do? Hi Aarifah! Double check that you added all of the ingredients to the brown sugar mixture (sugar, brown sugar and salt). Did you add the egg and the egg yolk and the vanilla to the mixture as well? Also, your mixture may not thicken up as much as mine did in the photo, but it should thicken a bit. Ok, let me know if you did all of the above that I just stated. Just so you know, I make these ALL the time and one time I didn’t add enough flour by mistake and my cookies came out flat and spilled out all over the baking sheet. I couldn’t figure out what happened and you know what? I double checked in my head the list of ingredients and realized that I was short 1/4 cup of flour, so now I double check what I do each time because it’s easy to forget or measure something wrong! Love these! Great stuff, Jackie. Thank you. THESE WERE SO GOOD!! I did make a few changes, I only used 1 cup of semi sweet chocolate chips instead of a whole bag, just preference. And I used 1 cup regular all purpose flour and 3/4 cup white whole wheat all purpose flour, not for any particular reason. I think I used a much smaller scoop, I ended up with 35 cookies, perfect smaller size, but I swear I could have just eaten the cookie dough it was SOOOO good, which is probably why I didn’t have 36 ; ) Thanks for the great recipe!!! These cookies were AMAZING!!!! Thanks for the recipe! I am going to have to try these soon! But first, a quick question. While the first pan is baking, what do you do with the remainder of the dough? Do you let it sit at room temperature? Or do you refrigerate? Seems like subsequent batches spread a little more if left at room temp. I am always looking for a better chocolate chip cookie. I found it…here!! These are incredible, even if they are a bit more involved. It’s worth it. I substituted 1 tsp of the vanilla with 1 tsp of coffee extract. Delicious! Thanks so much for sharing the recipe. I have a convection oven. Do I still need to bake one pan at a time? Thank you for the website, very thoughtful 🙂 but I’m still going to try yours! I have one more question, why do you melt all but 4 tbs of the butter? Is there a flavor/texture difference as opposed to browning all 14 tbs? Hi Rebecca. Glad you want to still try the cookies 🙂 This recipe was from cooks illustrated and they broke the whole recipe down and explained why they browned the butter and why they whisked the sugars together with the butter etc. They did not explain why they melted only a portion of the butter though. Maybe they only melted a portion because it would not taste the same if all of the butter was browned, since browning the butter adds a nutty flavor to the cookies. The 4 tablespoons melt quickly though when you add the browned butter, so its just as easy. I trust cooks illustrated because they know their stuff, so I tend to not improvise when making a recipe from their site. Well, butter being pure fat is the biggest turn-off, mostly psychologically… I want to enjoy food, even dessert, without feeling like I’m hurting myself. I know it may seem sort of extreme, but the texture of butter when I get it on my hands is how I imagine it would be inside my body, clogging my arteries, etc. And the soy butter has good fat in it, poly and mono unsaturated and I really like the texture and flavor. I totally get the butter thing Rebecca. I am the same way with certain foods as well, and sometimes I get slack for it. We’re all different and we all have our things, its what makes us unique. You may want to try the below recipe from my friend Em. She has a “healthy” cookie recipe (no butter) and you can visit her link here. I haven’t tried it yet as my kids like the more “traditional” sweets, but I am going to try it this fall when they are back in school. Hi Rebecca! Once the butter is melted, it takes about 1-2 minutes to brown it. You really don’t want it totally brown, but want it to sit on the heat for a bit after it has melted. I just go for the smell. Once it starts smelling a bit nutty in aroma, I take it off the heat (get up close to your pan to smell it). Make sure to keep swirling the pan so the butter does not scorch. If you are worried about it, just time it for 1 1/2 minutes your first time. If you start getting a nutty smell earlier, then take the butter off the heat. I have made these cookies so many times and some times the butter has cooked for 3 minutes and other times it has cooked for 1 minute. They always turn out great, so it really hasn’t mattered. I will try and get a photo up to show people that step, but it’s hard to do as it’s such a quick process. I have never used soy butter, so I can’t help you there, sorry! What is it about butter you don’t like? I use all types of brown sugar. My favorite dark brown sugar at the moment is this brand I get at Whole Foods called, Wholesome Sweeteners organic dark brown sugar. I also like the Whole Foods organic brand of brown sugars. I’m sure any type of dark brown sugar would work well. It is recommended that you use dark brown sugar for this recipe. Let me know if you have any other questions! I’m happy to be of help. Good luck! I just made these again last week and they are SO good! What type of flour do you use? Unbleached AP flour or Cake flour or Bread flour? I just updated the recipe as I guess it really does matter what flour I use, right? Thanks for the tip. I use King Arthur’s unbleached all purpose flour. I have seriously made these cookies at least 10 times in the past few weeks. LOVE this recipe. It’s my new go-to and I consider myself a CCC connoisseur, they are that good. Thank you for sharing this recipe. You both rock, and I’m so happy that baker extraordinaires like youself love this recipe! You have reminded me that I need to make up another batch of these cookies, and like SOON! The C.I. recipe is always a great one. I find that I do get better results from creaming rather than melting the butter though. When I let it melt, my cookies are a little on the thinner side, whereas creaming is a guaranteed thicker (and chewier) cookie. Love this recipe though! I couldn’t resist making these cookies again. Twice in a week. These will be my Go-To Chocolate Chip Cookie. Did I mention already how much I love these? You totally had me with your photos on Foodgawker. Thank you for changing my chocolate chip cookie life, Jacquelyn. Really love all your step-by-step recipe posts too. Wow! Thanks so much Judy! 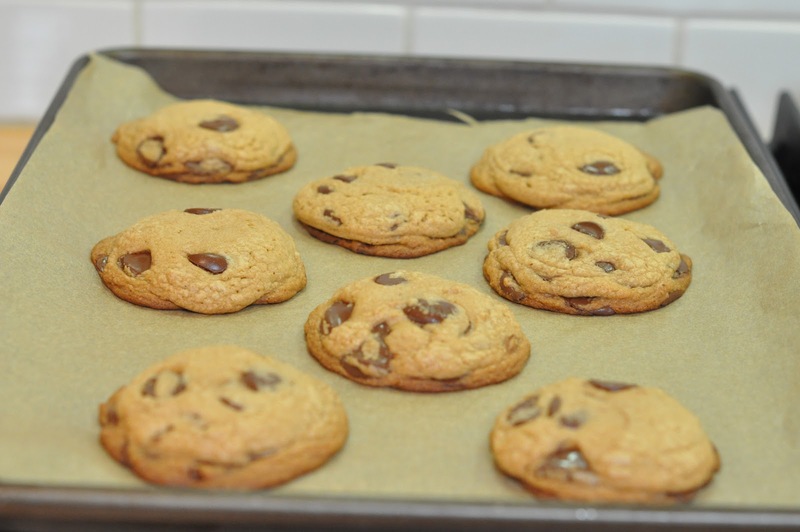 I am so glad you loved these and that they are going to be your go-to chocolate chip cookie. It’s wonderful when you can find a perfect cake, cookie and brownie recipe. I have my 3 favorites on this blog and I constantly make them and feel confident making them because they are my go-to recipes. They will be the recipes that my kids make for their kids, I hope! I am making these cookies this weekend, can’t wait! I love to make cookies and CC are my favs and my peeps love them too. SO, this will be an adventure to see how they turn out….will let you know! Hi Madeline! I can’t wait to hear how you like them. Please stop back and let me know. I brought them to a dinner party last weekend and people said they were the best CC cookies they had ever had, so I hope your friends feel the same. I have been looking forever for a recipe that produced flatter cookies with cripsy edges and chewy centres. I found this post via Foodgawker and baked them up right away and I have to say that they are sooooo good. These are by far the best chocolate chip cookies I’ve ever, ever made. They disappeared in next to no time and I can’t wait to make another batch. I’ve been testing chocolate chip cookies for what has seemed like since the beginning of time and none hold the potential of this one. All the other recipes I tested used the creaming method for the butter and sugar but this one was a complete revelation to me – melted, browned butter. Pure genius! The melted butter makes all the difference! I’ll never go back. I’m so pleased with this recipe. There are a zillion and one chocolate chip recipes being blogged about and in cookbooks and finding The One has been like trying to find a needle in a haystack. You can’t imagine how much it will change my chocolate chip cookie baking life! It’s amazing that I didn’t even need to pull out the mixer. Thank you so, so much for sharing this recipe and for your great blog! Wow, thanks Judy for the amazing comment. It totally made my morning 😉 I got this recipe from cooks illustrated and they test these recipes to the ground to create perfection, so I knew going into it they would be great. I have been making these for years and every time I bring them to a function or dinner party people say they are the best chocolate chip cookies. I am excited that you found your go-to recipe for chocolate chip cookies. This is my go-to recipe as well as my chocolate cake one from Barefoot. I make those two all the time and I don’t feel the need to find another one. It’s nice when you can narrow down your recipe box to your favorites. Have a wonderful day Judy and please let me know if you try any other recipes! I have made a lot of chocolate chip cookies and tried a lot of recipes and this one is one the best. My family LOVED them. As a matter of fact, the first night I made them they were all gone when I woke up the next morning. Had to make them again the next day. Try this recipe, you will not be disappointed! Hi Faye & Yvonne! I am so glad you LOVED the cookies and that these are a new favorite in your house. I made 2 batches last week myself because they went so fast. Thanks for the shout out! Your picture was so beautiful I couldn’t resist favoriting on FoodGawker and clicking through immediately! I already have a go-to chocolate chip cookie recipe, but these look incredible…might even replace the others! Thanks so much Sarah! I had a few go-to recipes as well but am stuck on this one as the cookies come out perfectly every time. I would love to hear what your recipe is though? I think I need to bake a batch of cookies now. Those look like heaven! Love the dark sugar and the dark chips!